Give a natural glow back to your skin! Award-winning and much loved Skin Food in a limited edition gift tin. Award-winning and much loved Skin Food in a limited edition gift tin. With the same all-natural ingredients as when we launched it in 1926, Skin Food is the essential moisturiser and protector that's loved by everyone, whether they're at London Fashion Week or at the kitchen sink. 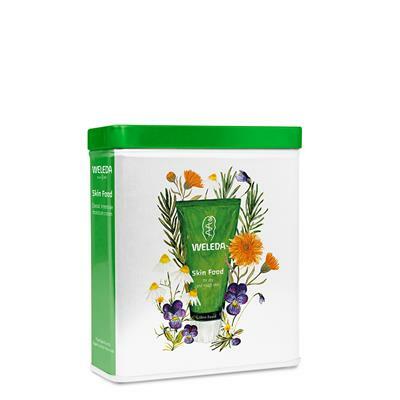 Highly effective, intensive hydration with soothing viola pansy, calming chamomile, healing calendula and rosemary to stimulate the circulation. Deeply nourishing with sweet almond and sunflower oils, this miracle cream locks in softness. Use the skin food, organic cotton flannel and skin food saviour leaflet to treat yourself to a luxurious and nourishing facial.